Thirty-one fantastical illustrations feature rolling landscapes that radiate energy and vitality. 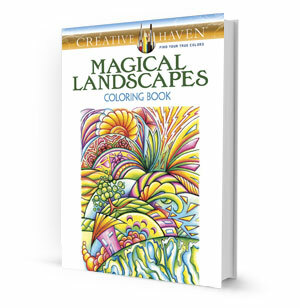 Scenes include a sailboat in tropical waters, forests and meadows of fanciful trees and flowers, sunrises over mountains and deserts, and many other imaginative locales. Pages are perforated and printed on one side only for easy removal and display. 31 magical landscapes feature a variety of panoramas right out of fantasy land! Each meticulously rendered image is highly detailed.